Matt Moseley, photo by Ivan Jones. Prior to joining UAL Awarding Body, I spent many years working with their qualifications on the other side of the fence; most recently managing creative courses at Suffolk New College in sunny Ipswich. 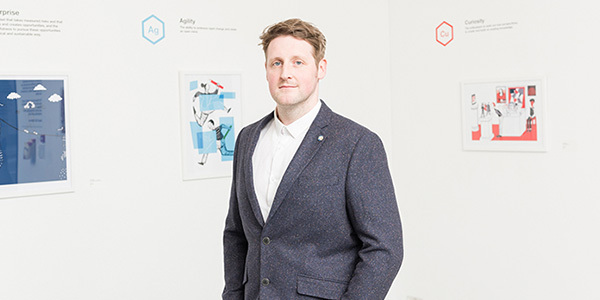 During my seven-year tenure as Programme Leader there, I worked with staff and students to deliver successful UAL programmes in Art & Design, Media, Games Design and Performing Arts at levels 1-4. During this period, we benefitted from many positive visits from UAL External Moderators and Chief Examiners, so when the opportunity arose to write a blog on ‘how to prepare for moderation’ I felt I should share my experiences. The first port of call for any pre-moderation preparations should be the UAL Awarding Body Centre Handbook. This document is a one-stop-shop, covering the delivery, assessment and moderation of UAL Awarding Body courses. It provides wide-ranging advice that covers all the subject pathways as well as more specific guidance on moderation in sections 3.1 and 3.2. Here you’ll find a breakdown of the moderation process from its overall purpose, through to sampling, feedback and next steps. If you are booked in for a moderation, make sure that you give these sections a thorough read. It’s worth keeping moderation in mind when planning the final major project with your students. Encouraging students to ‘flag post’ their projects prior to submission will make it easier to mark, and in turn help your moderator to identify where and why grades have been awarded accurately. Students can quickly and easily use post-it notes or tags to show where they have made key creative decisions, documented pivotal research or solved specific problems. This practice can also really help students to structure their project analysis and evaluation. Talk to your students about moderation too; let them know the process and how important it is that their work is presented clearly and coherently, showing the narrative of their project in a considered manner. Make them aware that blind-markers will be new to their work and will not have the understanding that you do. Don’t try to tackle moderation preparation single handedly (particularly with large cohorts) as there can be a lot to do. Undergoing moderation is a team activity so make sure you organise a meeting in good time to identify roles and responsibilities for each of your team members. Check that all members of your team have a clear understanding of the moderation process as this will increase buy-in and support. If other areas of your institution are delivering UAL Awarding Body qualifications, discuss your plans with them and share practice where possible. A standardised approach across the department will save time and make preparation more efficient. The most valuable support mechanism offered by UAL Awarding Body is the ‘human element’. Moderators are often tutors who deliver UAL Awarding Body qualifications at other institutions, so you should view them as approachable. They will be happy to be communicated with and willing to offer support and guidance on preparing for moderation. Moderators can’t advise on the grading of student work – as they are there to check your course team’s assessment against the national standards – but they are able to answer questions on moderation preparation in the lead up to a visit. You will receive an email from your moderator prior to their visit, so use this opportunity to ask any questions you may have. Issues raised prior to moderation will have no negative bearing on the visit, so do not worry about asking questions (even if you think they are obvious). Ensure that you afford yourself enough time between submission, assessment of work, and the moderation visit. In addition to checking and organising work ready for sampling, you will need time to identify and resolve any missing student authentication forms, bibliographies and other essential paperwork. Any referred work should also be re-marked at the point of moderation. Lay the work out in the largest space available and, once organised, draw a simple map of where each student’s work is. Some centres have very large cohorts of students and being able to lay your hands on a sample quickly and easily makes for a smoother moderation. Once you have your sample organised, set up a mock moderation visit with a staff member who hasn’t worked with the group, to see if they can easily find the samples and navigate their way through the projects. Inviting a member of your senior leadership team along can be beneficial too; it can be a good way to showcase your students’ work to management and in turn gain recognition for your team. If you are including digital or video evidence in the sample, make sure all students are clearly labelled and be prepared to help the moderator to navigate sampled students’ work. Make sure that you test any technology (internet access, blogs, dvd players, network logins etc.) on the morning of the moderation to ensure that all is working. It may also be useful to inform your IT and Facilities teams of your moderation date, so they can be on-hand to assist if required.